Evidence of paternalism in the Water Street store might be something as seemingly simple as a company dinner in honour of the owner's birthday, a wedding anniversary or a victorious company team in such events as the Mercantile Hockey League or the Regatta. During the Christmas season, it might be found in the procession of store workers through the boardroom to personally receive their bonuses from the company directors. Such generosity on the part of store owners cost little and the rewards were great. The merchants of St. John's were well aware that just as "you will never get a crew worth having to go in a vessel which is very uncomfortable," you could not expect loyalty and hard work from a store clerk or saleslady without rewarding them. With the outbreak of World War I in 1914, merchants found an opportunity to seek repayment for years of dinners and bonuses by urging their store clerks to enlist for military service. 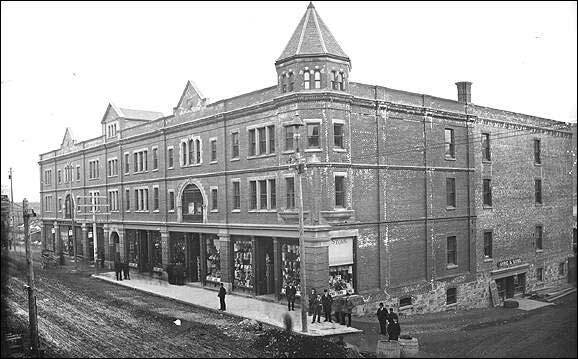 As prominent members of the Newfoundland Patriotic Association, charged with organizing Newfoundland's war effort, the Water Street merchants with 20 per cent of the St. John's work force employed in their offices and shops, had a fair portion of the city's eligible servicemen under their employ. Responsible for recruitment of volunteers, these NPA members turned to their own workers to boost enlistments and lend legitimacy to their handling of the war effort. Courtesy of Archives and Special Collections, (Historic Photographs Collection of the Department of Geography, Collection 137, Photo 2.01.009), Queen Elizabeth II Library, Memorial University of Newfoundland, St. John's, NL. Enlistment was especially useful as an outlet for surplus labour when trade began dropping off at the start of war. In order to avoid layoffs, store workers were encouraged to sign up. But when business began to pick up in the weeks leading up to the first Christmas of the war, the NPA decided to allow the employees who had enlisted to delay training until after Christmas. In short, as NPA members, store owners were able to use their relationships with employees to control shortages and surpluses in labour to their advantage while, at the same time, running a relatively successful recruiting campaign. This is not to suggest that the merchant families' commitment to the war effort only went as far as getting their employees to enlist; the Ayres, Bowrings and Macphersons also joined up, but as officers rather than ordinary soldiers. Barriers that had existed in the store, distinguishing owner from worker, were recreated in the country's military between officer and soldier. The Newfoundland Regiment was described as "a motley crew of fishermen and loggers and trappers, with a sprinkling of St. John's merchant princelings on top..." (Gwyn 298). Again in 1939, many of the Water Street firms were represented on the NPA and again, they used their influence with employees to raise enlistments. In the case of Bowring Bros., at a dinner held in honour of their enlisted employees, it was announced that the Bowring family continued to operate the company only in gratitude and loyalty to its employees and customers and from a sense of family tradition. Such statements implied that Bowring's was not in business for profit but for the welfare of employees and customers - that the company was more beneficial to its workers than to its owners. Such expressions of the company's commitment to a long tradition of noblesse oblige and paternalism were intended to ensure that the confidence of workers and customers alike remained with the firm. Courtesy of Archives and Special Collections, (Historic Photographs Collection of the Department of Geography, Collection 137, Photo 2.01.017), Queen Elizabeth II Library, Memorial University of Newfoundland, St. John's, NL. Such words and actions naturally led workers to believe that their best interests were amongst the primary concerns of store owners. However, they were to find during the shop closing debate that this was not always the case. 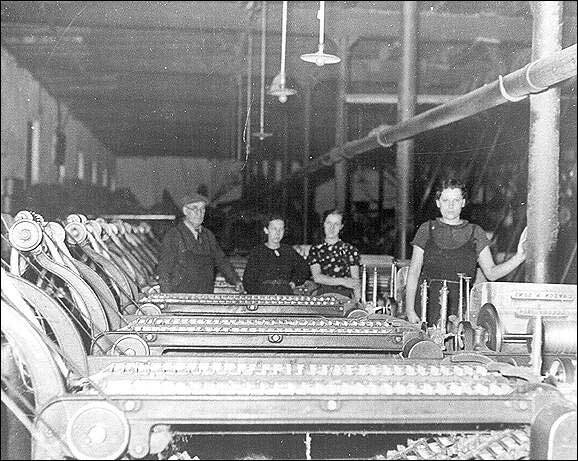 In St. John's, many shop clerks and sales ladies worked anywhere from ten to thirteen hours a day with no extra pay for overtime. As early as the 1890s, letters of complaint appeared in the city press requesting that legislation be enacted to limit the hours of operation for stores. Despite a persistent and sometimes vigorous debate over the issue, nothing was done to address store employee concerns until Commission of Government took action in 1936 with the "Act to Regulate the Closing Hours of Shops" which met many of the workers' demands. 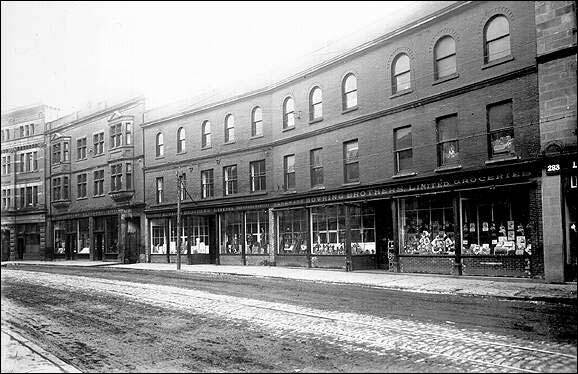 Even though they were not opposed to the idea of closing their stores earlier than was the practice, the Water Street merchants refused to consider it until their competitors on Duckworth St. agreed to close as well. It took government legislation to achieve what their employers had not even opposed in principle. The Depression of the 1930s forced many store employees to realize that in times of economic trouble, it was every person for his or herself as the Water Street firms cut wages and laid off workers. The economic situation meant that many of the benefits they had come to expect from their employers were no longer afforded to them. Traditionally, store employees had been a very difficult group to organize but with the hardships caused by the Depression, the loyalty that employees had once been encouraged to have for their employers no longer applied. When retail workers were approached with the suggestion of forming a union in 1938, many were willing, resulting in the formation of the Newfoundland Protective Association of Shop and Office Employees (NPASOE). Courtesy of Archives and Special Collections, (Hattenhauer Labour Collection, Collection 79, Box 1, Series 2, Photo 2.1.01), Queen Elizabeth II Library, Memorial University of Newfoundland, St. John's, NL. Employers' initial response to the creation of a shop workers' union was to discourage their employees from joining up but when it became clear that few could be dissuaded, store owners founded their own association to deal with worker demands. Negotiations between the Importers & Employers Association and the NPASOE lasted eighteen months ending with an agreement satisfying worker demands for the standardization of rates of pay and improved working conditions. A long history of close working relationships between the Water Street merchants and their employees had come to an end. Those benefits that workers had previously enjoyed under a paternalistic employer, the limits of which were often determined by economic conditions, were now entrenched in a contract, heralding a new era in labour relations, one characterized by unions and negotiations rather than birthday dinners and annual processions through company board rooms to collect Christmas bonuses.